Did you know that 89% of B2B marketers use content marketing as a part of their marketing strategy? Well, that is a significant number. The rising popularity of content marketing stands testimony to the benefits it offers. Every business, big or small, is realizing the amazing potentiality of content marketing. However, as per a report released by Content Marketing Institute (CMI), only 37% of marketers have a proper content marketing strategy for their company in sight. And all is documented. 38% of marketers agreed to have a proper content marketing strategy in place, but do not document it. This means that most of the tactics crafted get lost in the application process. Efforts to formulate and record a content marketing strategy for B2B companies is fruitful, and there is no shade of doubt in that. Yes, it might seem risky for the chances of failing are high. But when you have the right direction to steer to, your content marketing strategy can be a successful one. However, no content marketing effort ever goes to waste. Still not invested in the idea of making a content marketing strategy checklist? These numbers will convince you otherwise. So, there is no doubt that content marketing is compelling enough to boost businesses to the epitome of success. Each piece of content you produce can have a profound impact on the marketing outcome. 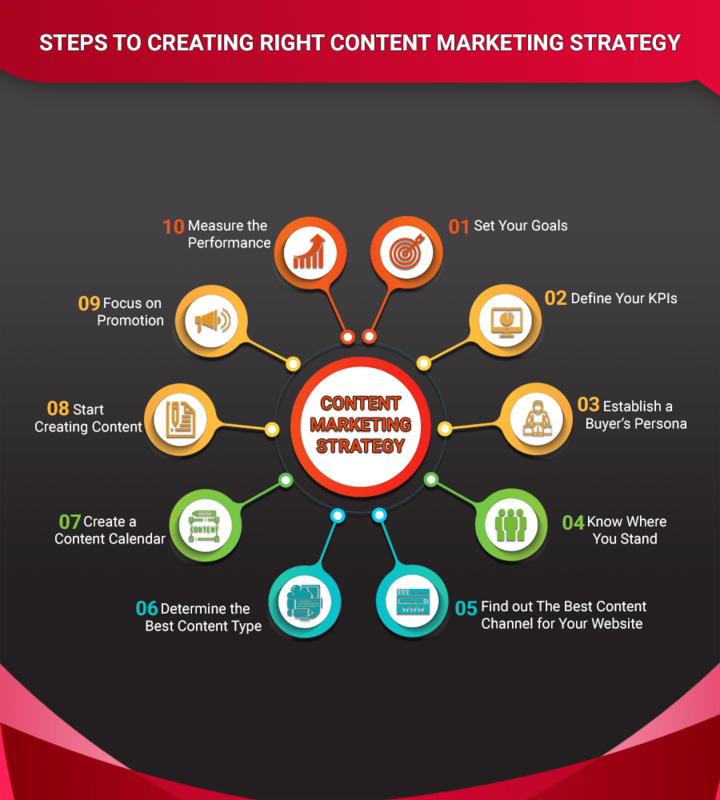 Content marketing strategy needs to be used right to get the maximum result. Don’t believe me? Well, here is an example for you. If any company has done content marketing right, it has to be HubSpot. Their content marketing strategy is simple. So should you start writing in-depth blogs answering the pain points of your readers? Wait, you should do that, but before you plunge into making a content marketing strategy, be aware that it is unique for every company. The strategy destined to work for your business might not bear as fruitful results for a different company. In short, content marketing strategy is subjective and can change. But you don’t need to shoot out in the dark! For your reference, I have put together a list that highlights the right steps you need to undertake for crafting a successful content marketing strategy. The first step to an effective content strategy is to have a clear idea about your goals. Think of this objectively. You need to content to meet your marketing statement. No matter how brief it is, having one mentioned gives you a sense of direction. Well, let’s put it this way- having a set of goals can give you direction. It will allow you to understand what is essential and what is not. To ensure that your strategy is on track, you need to be familiar with your goals. So be it improving revenue or making more sales, getting more traffic or gaining more influence on your niche industry, laying down your goals will give you an idea about what you aspire to achieve the most. Moving to the next step becomes easier when you know what you want to achieve. So, start with identifying your goals. KPIs or Key Performance Indicators allow you to turn every goal of yours into something specific and measurable. So, even with your content marketing strategy, you shouldn’t let it go. KPIs give you an idea about how much of the goal you have achieved. The most common KPIs for a website include revenue, SEO, sales, traffic, and subscribers. Now, use each of these indicators to give a more definite answer on your performance. For instance, if your goal is to increase traffic to your website, you may want to post engaging content. Your goals should be synonymous to your KPIs and vice versa. Find adjacent KPIs for each of your content marketing goals to witness it come to fruition. No matter how full-proof your content marketing strategy is, without a target audience in mind, it is impossible to attain anything. To have an effective content marketing strategy, you need to establish a buyer’s persona. A buyer’s persona is a fictional representation of a potential customer. It helps us formulate an idea about who we are targeting and trying to attract to our blogs. Without a buyer’s persona in place, it is difficult to craft content. Since you need the right content to reach out to them, without knowing who you are targeting, everything is futile. So, how do you determine your buyer’s persona? There are several ways to establish a buyer’s persona. One of the most common methods to do so is to segregate them based on their age, gender, demographics, location, education, income, preferences and so on. Another popular method is to collect information from your visitors and get feedback from them. Ask them about their pain points. HubSpot was so successful in their content marketing strategy because they determined their target audience and shortlisted their pain points, only to answer these in their blogs. For your strategy to succeed, you need to lay down a proper sketch of your target audience. You may already have content published on your blog. Or maybe you are entirely new to the domain. Whether you specialize in blogs or videos, when it comes to making a content marketing strategy, you need to analyze your current position. The idea is to understand whether the content you are producing is helping you attain your goals. This step is also referred to as a content audit. You go through all of your published pieces of work, be it blog posts, guest posts, social media posts or even the version displayed on webpages. Assess their success or failure and find out the gaps. You can also compare your content to that of your competitors. Your objective here- to find out how you can make new content fit in the market. You can use prevalent tools such as SEMRush to audit your content. By auditing your content pieces, you will know exactly where you stand, giving you a better perspective on what needs to be improved. Once you have a target audience set, the process of finding the right channel to reach them becomes more comfortable as well. Yes, we know that 86% of our audience is online, but the best-suited medium to approach them can vary greatly. When it comes to B2B marketing, sharing content on both social media channels and through email are considered nifty. Social media channels, mainly, Twitter, Facebook, and LinkedIn work wonders for B2B content. While 97% of marketers rely on LinkedIn for content marketing purposes, 87% believe in the effectiveness of Twitter. 86% of the marketers have agreed to use Facebook for sharing content, followed by 60% picking YouTube as their preferred medium. The more familiarity marketers have with these channels, the higher the reliability. As for emails, 59% of marketers agree that it is the most effective channel to reach out to potential customers. Not only emails feel more personalized, but the ROI is high. Identifying the best content channel for your website is a pivotal part of your content marketing strategy. Some tools can help you figure it out; one such means being Buzzsumo. After you are done selecting the content channel, you need to opt for the best content type for your business. Content type plays an essential role in your content marketing strategy. For instance, most successful businesses rely on pillar contents, which can be repurposed and re-shared on other websites. Pillar content plays an essential role in building credibility for your website. And these never go out of style. What type of pillar content do you want to create? It can either be blogs or infographic. Or it can also be a video. You need to identify which type of content delivers strong results for your website. While for some businesses, videos are a go-to, there are a few businesses which thrive on long-form content. Whichever content type you pick, ensure that it adds value to your readers, provides a solution and can be shared further. The most popular content types include blog posts, video, infographics, ebooks, case studies, whitepapers, and slide shares. If you want your content strategy to work, you need to have a content calendar. Why do you ask? Well, because you need to have an idea when you will be publishing what content and on which platform. Planning is an essential aspect of content marketing. Lack of planning is one of the most significant drawbacks of content marketing. A calendar gives you a clear idea about the actions you need to undertake. There are various tools available, which allow for scheduling your content. For instance, Google Calendar lets you insert due dates for each piece of content to be published. An editorial content calendar is a must to fast-track your content strategy. Before you start creating content, your content marketing strategy needs a lot of prep work. The previous steps highlighted the prep work. Once you complete the same, you need to start working on writing the content. Content creation is not an easy process. Even when you have a clear topic outlined, you need to put considerable time researching for the right resources. Also, you need to determine the title of the piece, find the right keywords, and keep in mind SEO tactics. The tone of your content plays a significant role in the kind of reaction you get from the readers. Your content acts as the voice of your business. The need to establish yourself as the thought-leader of your niche also becomes a primary aspect. Content creation takes time. Therefore, be sure to spend a considerable amount of time perfecting and optimizing the same. Your content marketing strategy doesn’t end with creating content. You still need to distribute your content, promote it to ensure that it reaches its destination. Whether sharing on social media platforms or using emails or maybe both, make sure you schedule the same. Your content should reach its readers immediately after it is published. Not only does it increase perceptibility but it also aids conversions. Promoting your content at the right time is essential. In simple words, your content should not go unnoticed. For instance, the best time to post content on Facebook is during Monday, Wednesday, Thursday, and Friday between 12 noon to 3 pm. If you are posting on weekends, the best time to get noticed is between 12 noon and 1 pm. Similarly, for sending emails, the best time is late morning, between 10 am to 11 am; or from 8 pm to midnight. When promoting your content, your aim should be to get noticed. Hence, keeping a close eye on posting time statistics is essential. Find out when your customers are most active and utilize the same wisely. P.S. Do add the sharing time on your editorial calendar. Your content marketing strategy is not complete until you measure results. The KPIs you defined early on will come to play now. Measuring results are not only a great way to assess what has changed but also get clear about achievements. To witness your business succeed, you need to know whether or not you are hitting your targets. Keeping a tab of the KPIs make this possible. Google Analytics and SEMRush allow you to measure content results. By getting a clear idea of the analytics, you can make tweaks accordingly. Knowing the outcome of your content will give allow you to make improvements accordingly. From the number of visitors to bounce rate, you can get detailed information of the same. But be mindful of measuring your performance. Content marketing strategy is essential for businesses who are relying on the incredible power of content. Without a plan, you are seemingly lost. It might seem like tedious work, but creating a content marketing strategy is easy when you know which direction to head to. Keep the points as mentioned above in your mind, apply them effectively and meet your business targets comfortably and efficiently. Need help in creating a useful content marketing strategy? Then subscribe to our blog today and get weekly tips mailed straight to your inbox. Shiann Garcia is a blogger and content writer with ample experience in the field. Inspired by her travel escapades during her college days, writing to express herself has been her forte. Sharing a deep insight into content marketing has allowed her to understand the varied perceptions of the marketing business world. Shiann loves to cook during her free times and enjoys learning more about different cultures.